Every time I return to London, we have both changed. I always look for something different, so the city offers me difference. This time round, I noticed how Dalston is developing and upscaling itself. Shoreditch to the South and Stoke Newington to the North both used to be grotty areas in the 1980s. Both developed in the 1990s, and are now unaffordable for the vast majority. Dalston was always that even-grottier place between. Well, not for much longer. 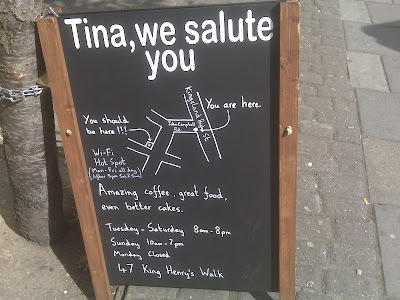 Places like Cafe Otto and Tina, we salute you (funny signboard pictured) are sure signs that if you want to live in an increasingly trendy part of town, you'd better move in quick. Even with relatively poor transport links (buses and London Overground), property prices are sure to rise in the next few years in Dalston.